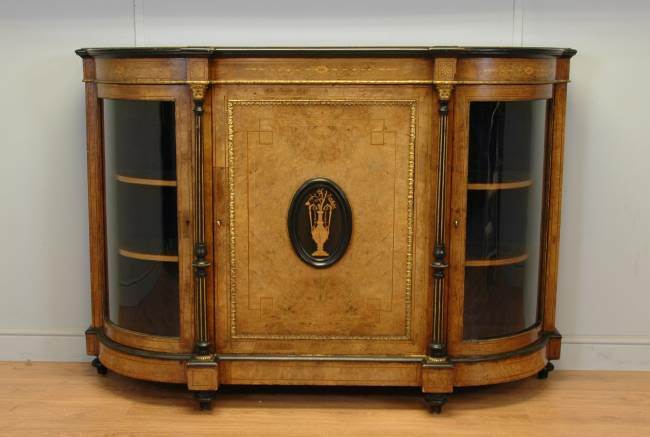 The antique credenza is a fine quality, highly decorated and shaped piece of antique furniture in the form of a sideboard or cupboard that was fashionable during the Victorian period. 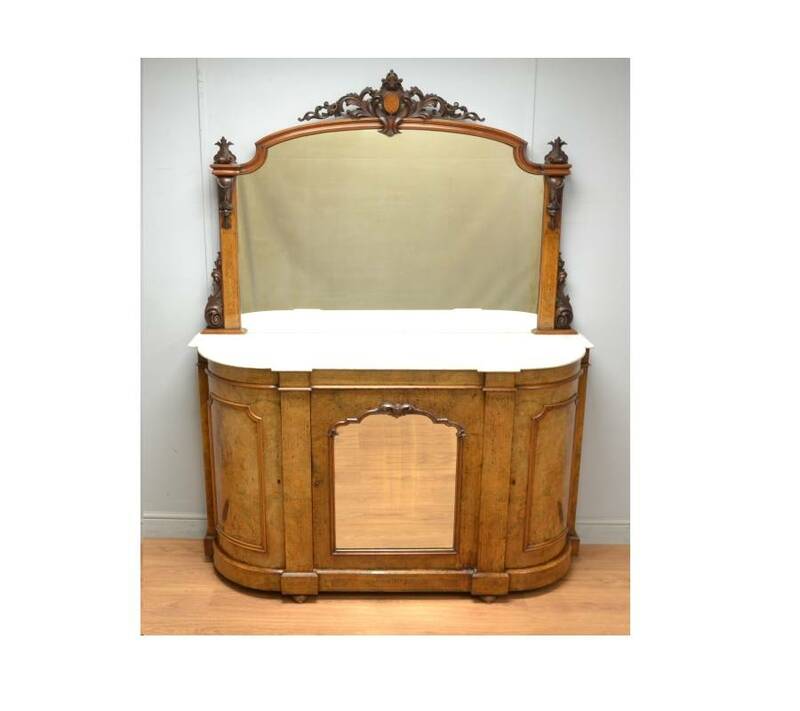 They were only built by the best Victorian master craftsmen as they were detailed with fine veneers and beautifully figured woods for clients who would have been wealthy and wanted a piece of furniture to impress. Decorations such as marquetry, parquetry, figured burr walnut, inlay, brass decorations, marble tops and mirror backs were used in the construction. 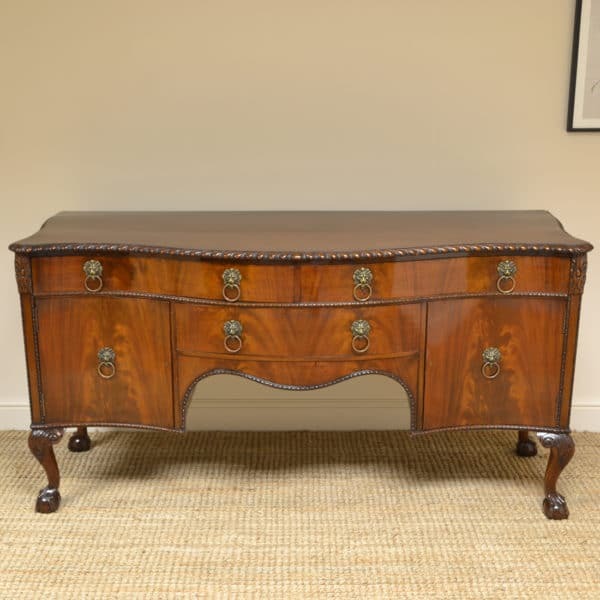 Some of the finest examples have been sold here on antiques world and for our latest inventory please visit our antique sideboards category here. We have also has some exceptional examples that we have sold and you can see some below. If you are specifically looking to buy a credenza and one below looks of interest, please let us know and I will add you onto our wanted book. 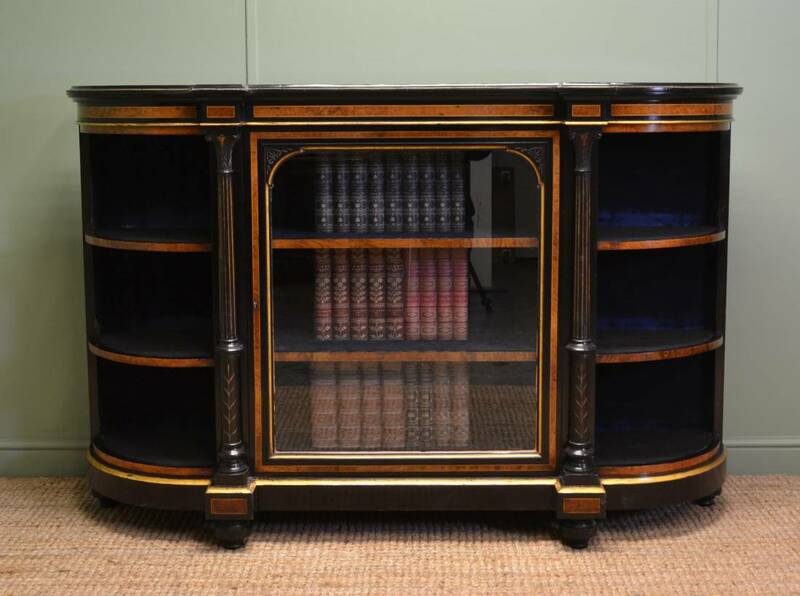 Magnificent Quality Ebonised & Satinwood Inlaid Antique Credenza. 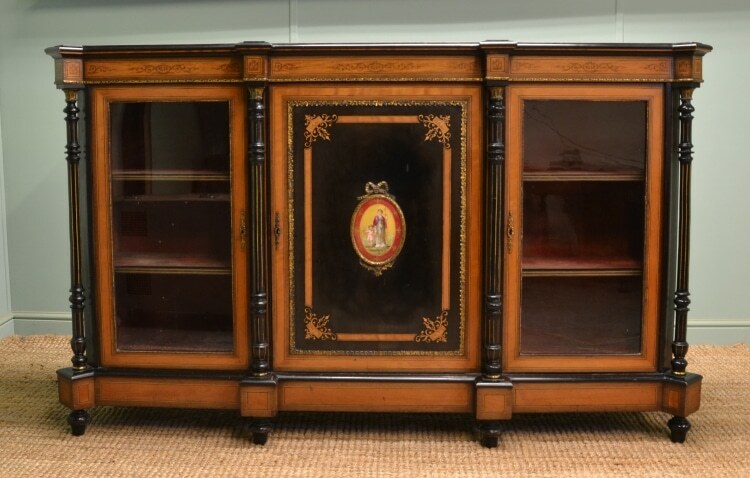 This fabulous Victorian antique Credenza dates from around 1870 and looks magnificent with its ebonised finish and satinwood inlay. The shaped moulded top sits above a deep beautifully inlayed frieze with decorative brass trim. The two outer doors are glazed while the central door is delightfully decorated, has brass trim and an oval portrait as its centre piece. The doors benefit from a key and working locks and each interior has two removable shelves and still contains the original red velvet lining, worn but still in good condition. The front displays four beautifully turned, reeded columns topped with brass Corinthian style capitals. This opulent Victorian antique credenza stands on turned bun feet, has the original back boards and has an ebonised finish with striking satinwood and walnut inlay. 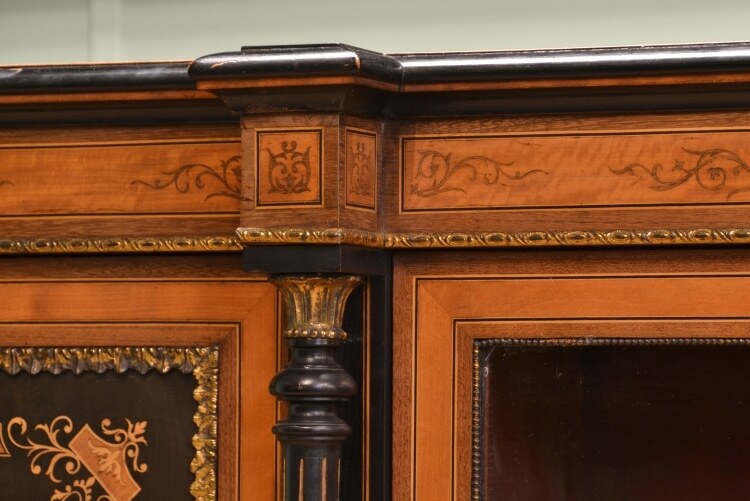 Dating from around 1870 in the Victorian period this opulent credenza is stamped by the renowned maker Wilkinson & Son, 8 Old Bond Street, London. 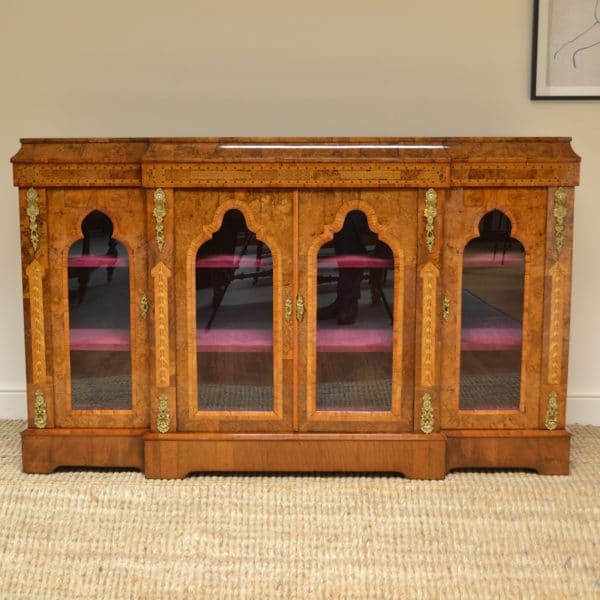 With an overall ebonised finish this fine quality piece has a beautifully decorated shaped top with burr walnut inlaid banding and boxwood string inlay surround. 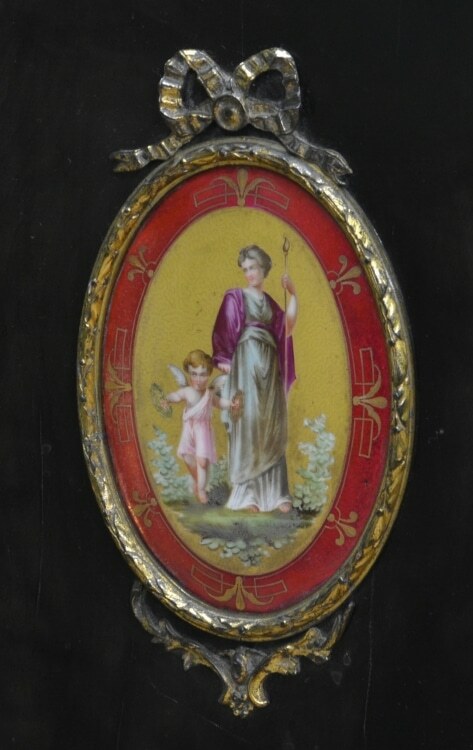 It also has a moulded edge with decorative brass beading above a frieze with gilt finished lower edge. The central glazed door is flanked by two beautifully turned columns with Corinthian designed capitals while the interior has two removable shelves and is lined with the original dark blue velvet. The outer sections are bow fronted with two removable shelves and the whole piece stands on decoratively turned feet. The credenza has a rich ebonised finish with a striking grain, good patina, is in very good condition and has been beautifully cleaned using a traditional form of wax finishing. 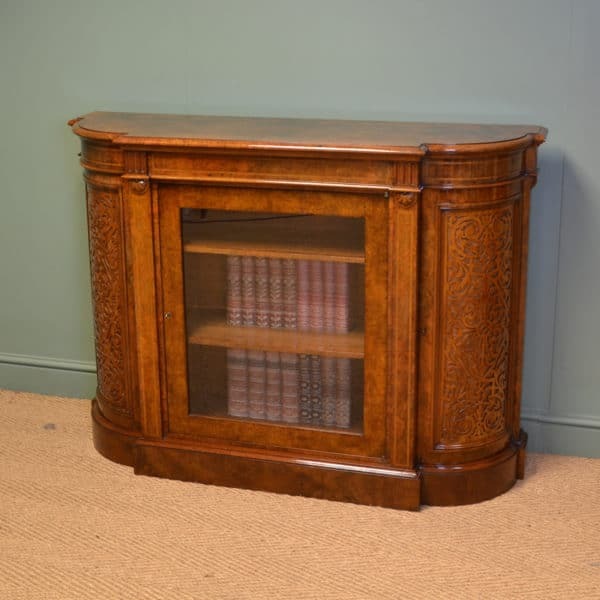 Victorian Burr Walnut Antique Credenza of the Finest Quality. This supreme Victorian burr walnut antique credenza, circa 1870, is of the finest quality and oozes opulence, it is a rare find indeed. This ornate piece has a beautifully figured top with brass beading and an ebonised moulded edge that sits above a stunning inlaid central door, again with brass beading, with an urn inlaid central plaque. The central cupboard has one removable shelf and has the original blue velvet lining. 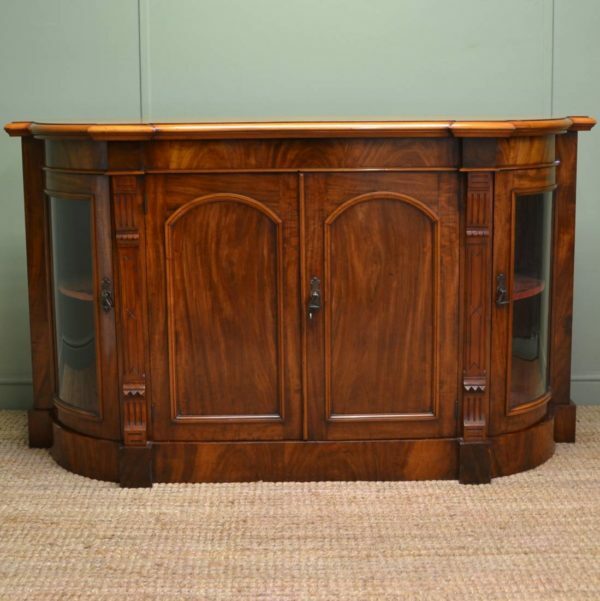 The antique credenza has beautifully turned reeded upright supports and the outer doors are bowed fronted and glazed with key and working locks. Each of the outer sections has two bow fronted fixed shelves again with the original blue velvet lining. 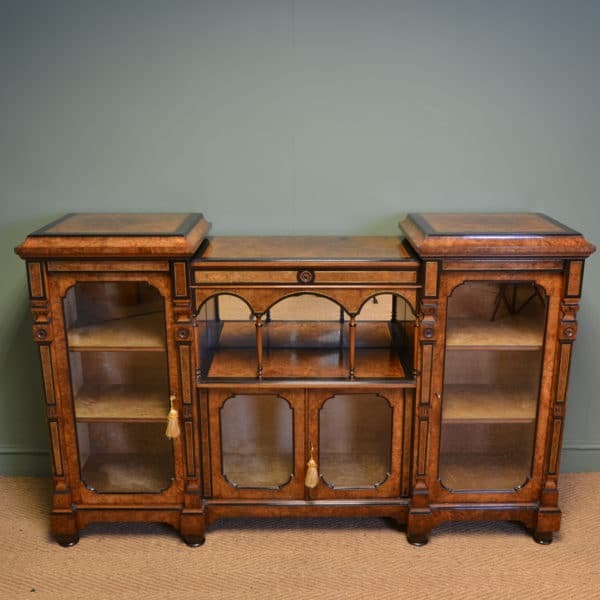 This remarkable piece stands on four turned bun feet, has its original back boards and is a rich, golden walnut. 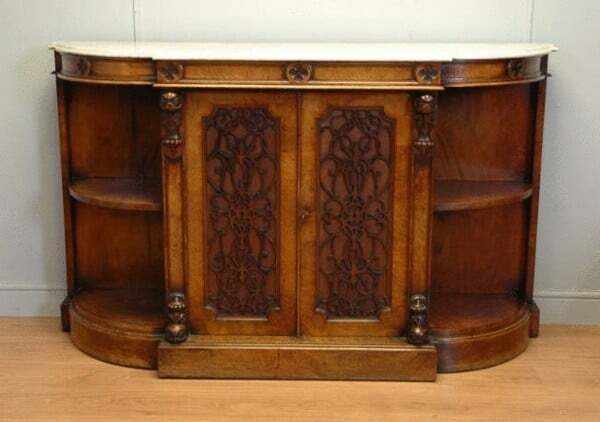 Figured Walnut Antique Victorian High Quality Credenza. 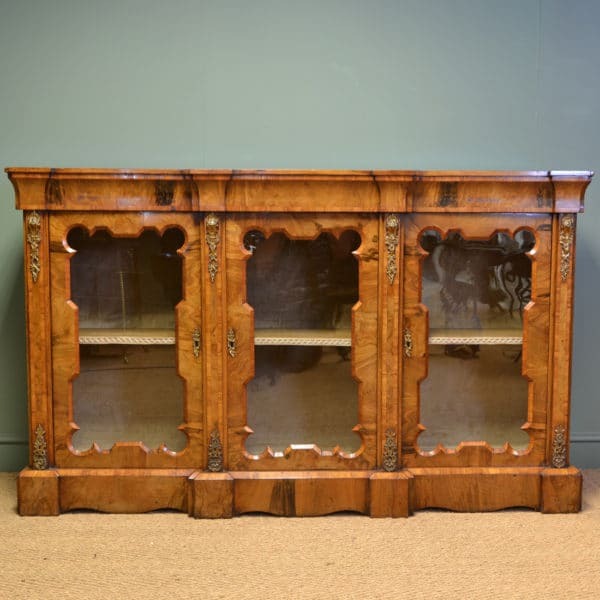 This credenza is of the highest quality, dating from around 1860 in the Victorian period, and is made from beautifully figured walnut. 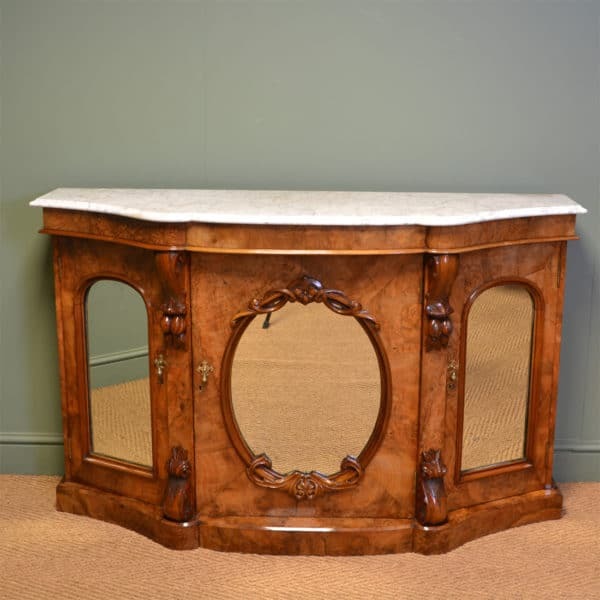 It has a magnificent, delightfully carved, mirrored back with moulded edges and elegant inlay detailing. 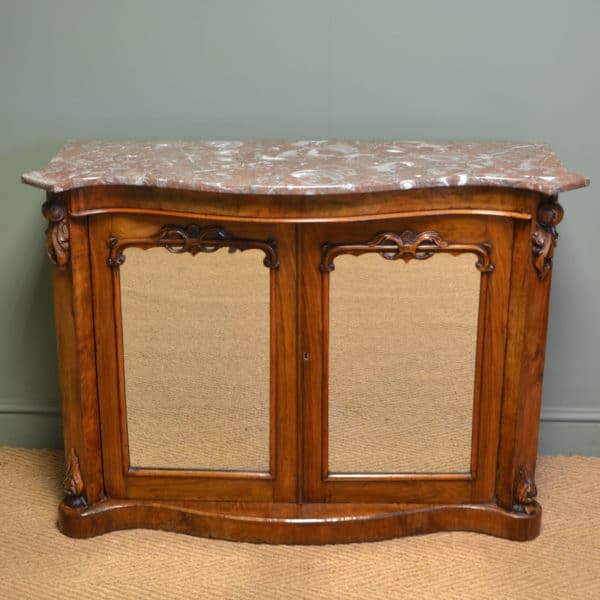 The shaped marble top sits above a central mirrored door with moulded edge and beautiful carvings along with key and working lock. When opened it reveals a cupboard with one removable shelf. The outer cupboards are bow fronted with moulded edges and beautiful inlay. They both have working locks and each interior contains a single removable shelf. This quality antique credenza stands on an inverted break-fronted plinth with turned bun feet and has a real sense of opulence. 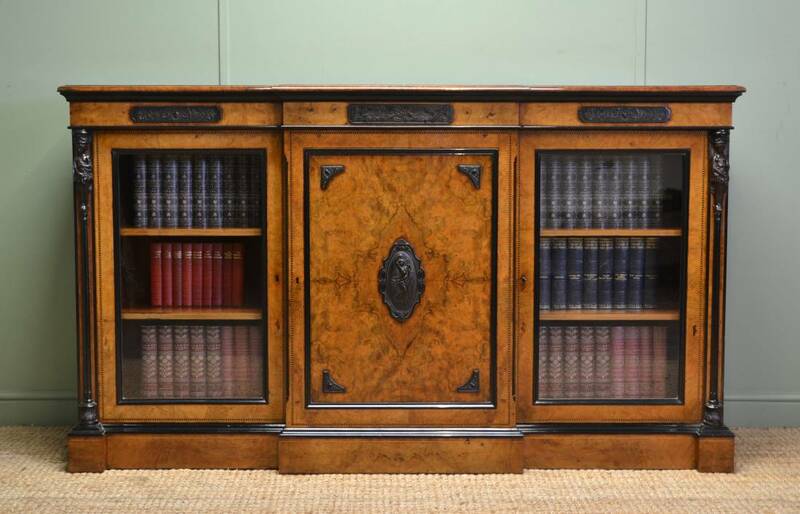 superlative quality Victorian figured Walnut antique credenza, circa 1870, has the original cabinet-makers stamp belonging to J. Yabsley’s of Plymouth. Hello JamesJust a quick email to let you know that our sideboard and bookcase arrived safe and sound this morning. We’re absolutely delighted with both pieces, they’re lovely thank you.We’ll be sure to check your website regularly in the future.Thanks again. 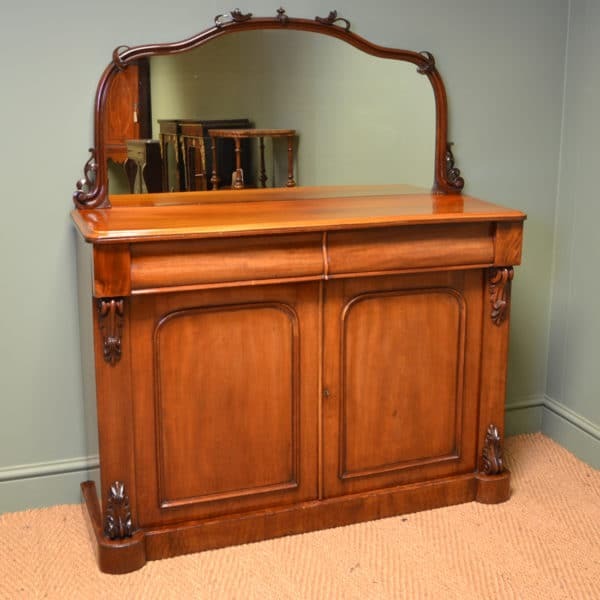 Dear James,Thank you for the delivery of our Chiffonere we are very pleased with this wonderful peace of furniture.If we are in your area we will call to see your stock of antiques.